More questions have surfaced in regard to the $40 million contract to overhaul the local 911 radio system since the Mobile County Communications District (MCCD) agreed to pay for an independent investigation into the contract earlier this month. Now — citing the potential for litigation — the board has agreed to suspend the contract completely. 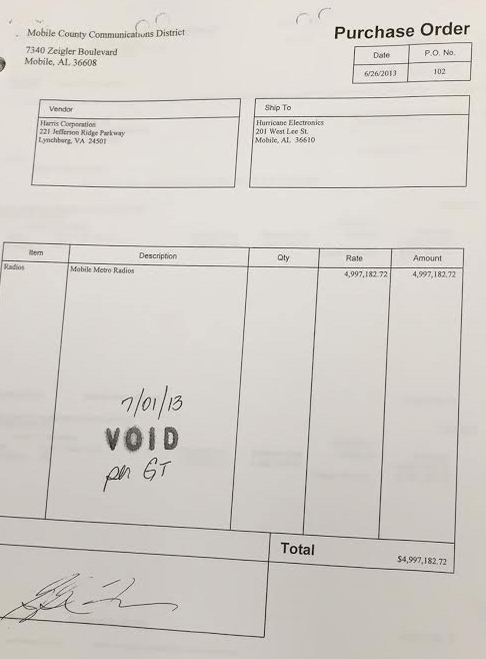 During a special meeting called June 30, the commissioners of the MCCD agreed to suspend all payments and deliverables related to the contract it signed with Harris Corporation in 2013. Up to $10,000 more was also allocated to the continued investigation into the contract, which has already cost the board $5,000. MCCD Commissioner Trey Oliver said the investigation shouldn’t take more than six to eight weeks to complete. The board also set rates for the six-person team of former auditors, private investigators and FBI agents that are currently investigating the pages and pages of documents and correspondence related to that contract. The rates of pay for six private investigators were approved by the MCCD on June 30. In the past week, several revelations have come to light and been reported related to the contract with Harris, including a June 12, 2013, pricing summary showing the company had been involved with the project before it was competitively bid in August 2013. MCCD Director Gary Tanner, who was just taking the reins of the 911 center at the time, said the early work can be attributed to the board’s plan to use Harris as a sole-source vendor through Alabama’s state bid list. The bid list includes several Harris radio products, Tanner said. A purchase order for more than 1,000 radios was issued a month before the project they were connected to was bid out competitively. The PO was later voided by Gary Tanner, Director of the Mobile County Communications Distirct. However, documents from the time show there was also some specific price negotiations and near payments during the “early” period Tanner referred to. Documents and emails obtained by Lagniappe show a purchase order for almost $5 million signed over to Harris on June 26, 2013. Today, the radios referenced in the email have been sitting in a Mobile County warehouse for almost two years. According to Tanner, they arrived before the project was competitively bid. Asked for an explanation, Tanner deferred to Stephen Smith, a project manager for Harris. Multiple calls to Smith were unreturned prior to this report being published. Though the project was bid, Harris was the only company to submit a proposal for the project. To be fair, the communications upgrade sought by the MCCD consisted of highly specialized work only a handful of companies are capable of providing. However, at least one other company tried to join the bidding war but apparently did so in vain. According to documents, Harris’ industry competitor Motorola wrote Tanner in August asking for a 60-day extension of the bid. 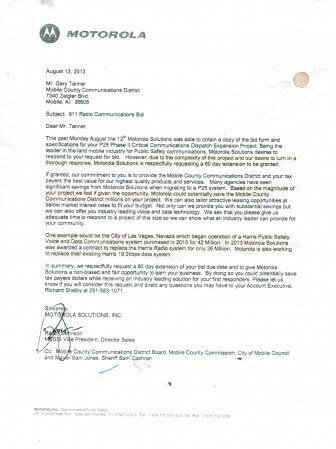 A 2013 letter from a Motorola executive shows the company attempted to submit a bid for the 2013 radio enhancment project in Mobile County. Wettermark gave an opinion the bid was legal. He was also later hired as the MCCD board’s attorney after Wasden left. 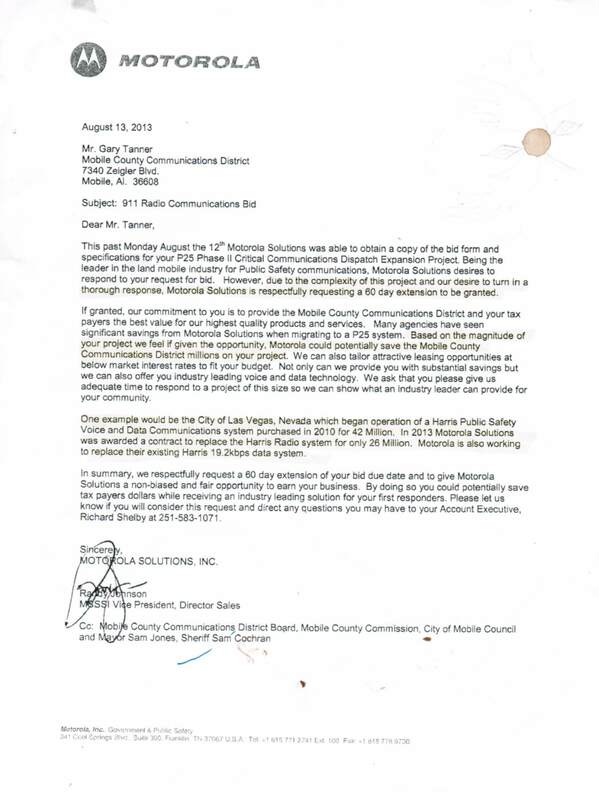 Regarding Motorola’s request for extension, Tanner further said it was the board’s desire “to encumber the funds before the fiscal year ending Sept. 30, 2013.” At the time, a significant change was about to befall the emergency communications world in Alabama as statewide legislation passed the previous year was scheduled to change the MCCD’s entire funding process. In short, without encumbering additional debt, the board was facing the loss of a significant portion of its funding, which would then be assumed by a state 911 board and redistributed to other counties. Because state law wouldn’t allow districts to collect more money than they need to operate, taking on the $39 million bond used to pay Harris was a quick way to increase the 911 board’s debt obligations. 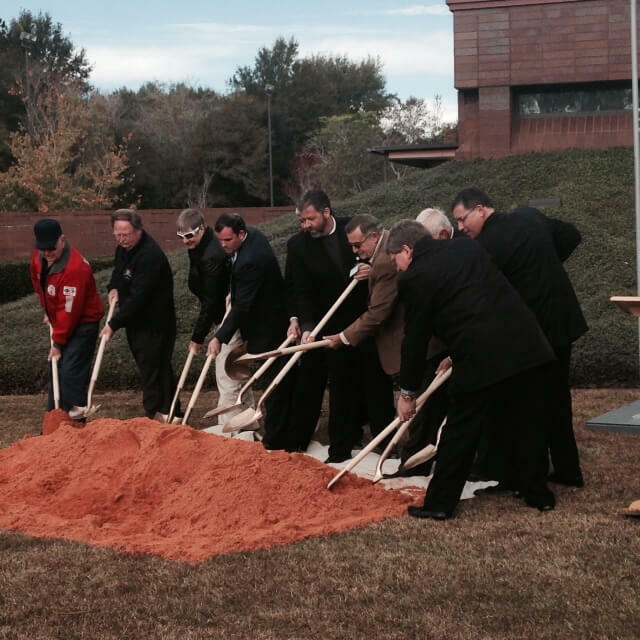 Commissioners from the Mobile County Communications District and Harris Communications representatives break ground on a $40 million emergency communications project Nov. 18. In fact, Harris played a crucial role in that process — working with the board to consolidate the seven-year plan to upgrade the communications system into a three-year plan. 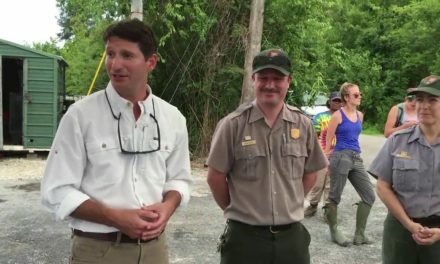 It’s been stated in previous meetings that during the process, Harris helped write the specifications for the same bid it would later be awarded. Despite their early involvement, Harris was still allowed to change the details of its project after the bidding process had begun. Earlier this month, Tanner sent a memo the board discussing those issues, which took place in 2013. “Harris submitted a pricing sheet as part of their bid proposal, dated Aug. 22, 2013. Subsequently, Steve Smith, Harris representative, discovered that their radios were not equipped to meet the agreed requirements developed by MCCD. The radios were reworked to be in compliance with the specifications That re-work was completed prior to the deployment of any radios,” the memo reads. At this time, it’s unclear if those same radios arrived prior to the bid being awarded. Almost half of the project’s cost is derived from various types of radio equipment. Update: As of July 1, MCCD Attorney Larry Wettermark officially stepped down as the board’s legal representation. In a resignation letter to the members of the board, Wettermark said “recent events concerning contracts that were let well over a year before (he) began representing the board” had emerged and had at least some effect on his decision to resign. Wettermark had served as the Board’s attorney since October of 2014.